NEW DELHI: India and the US have set up the first ever secure communication link between the naval headquarters here and the US Central as well as Pacific Naval Commands under the landmark Indo-US COMCASA pact reached last year. In a major boost to India’s defence diplomacy, the two upgrades will allow both sides to share real-time operational intelligence. In the case of the C-130s and C-17s, the systems were purchased but not activated because the US said it could not part with the encryption codes until the enabling COMCASA pact is signed. The establishment of a secure active link between the two navies is being seen as a significant step forward as India will gain access to latest US naval intelligence besides conducting joint operations in the future. The link was set up, sources said, by a US team which visited India recently. The COMCASA pact will in due course enable both sides to operate on the same communication systems, thus helping build an “interoperable” environment for militaries. Without this pact, the US could not part with highly coded communication gear with the military platforms they sell to India. As a result, India had to depend on less secure systems on, otherwise, high-end platforms like C-130Js and the P8I maritime surveillance aircraft, among others. 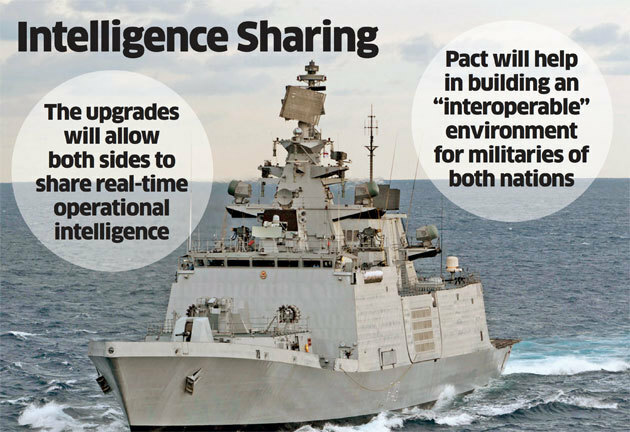 While negotiating the pact, India also obtained a reliability assurance from the US that it will ensure availability of secured communication equipment covered by the pact at all time as well as keep them operational. India was also assured that the US will not share data from Indian platforms with another country, nor access this data without prior permission. Also, sources said, the choice to upgrade would rest with India and not wholly determined by the US.